My kiddos have a short school week & we couldn't be happier about it! Friday was Future Friday at school & one was an Atlanta Braves baseball player & the other was a Kindergarten teacher! Friday night, we had dinner at home & watched Halloween movies. Millie Jo & I fell asleep on the couch at 9:00pm & it was amazing! Saturday morning was spent at the soccer field & this girl scored a goal. Our Saturday afternoon was filled with grocery shopping & yardwork because we get wild over here. HA! And it wore the girl out! She did SO good though! Sunday, after church, my mama cooked lunch. And it's always a fun time! I love him & he was loving Pop's hat. And now I'm thinking I need a similar hat for this fall/winter! 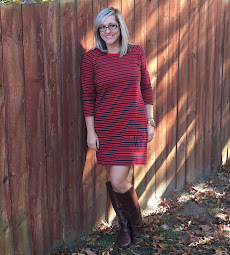 If we dress for fall, it will come … right!?! I love plaid but not near as much as I love these two girls of mine! Somebody loves white powdered donuts! Itty Bitty loves her some food! I hope yours was great!